Mr. Petrie, in Rogue One you played the part of General Draven. How did you get this role? A call came in from Jina Jay, the brilliant casting director, who told me that Gareth Edwards would love it if I could be a part of the film. I’m not sure I even asked what the character was. I was just thrilled to be asked. Shooting was to due to start just as we were to go on holiday so I spoke to my wife and she looked at me askance and said ‘Oh come on…it’s Star Wars…’ They still had a lovely time without me. What did they tell you about your character and how to portray him? Did they give you any background information for instance? To start with all I was told was that he was a senior military figure in the Alliance. We then spent a while discussing his political stance and his relationship with the Senators, other leading military figures, Mon Mothma of course. I developed a personal backstory for him which is always useful for any character you play. You may not see on screen what a character has for breakfast but I can tell you what it is if you ask. On set, before the cameras roll, you always discuss the minutiae of a scene with the director and your fellow actors. Everyone inputs, it is wonderfully collaborative. If ever I had a question on technical stuff John Schwartz was always on set to fill in any gaps. The man is a walking Star Wars encyclopaedia. Most of your scenes are with Felicity Jones and Diego Luna. Did you get along and how was it to work with them? Are there any good or funny stories of things that happened on the set you can share? Before we started, we had a Rebel alliance ‘meet and greet’ on set and some rehearsal time. There were so many cast and crew there we all had a white sticker with our name and character on so it was easy to identify everyone. At the end of the day I pulled off the sticker and not wanting to litter, stuck it on my laptop. It’s still there. I see it every day and smile. 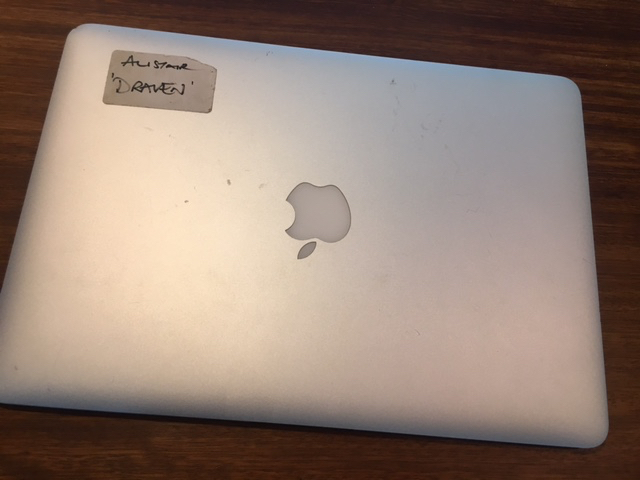 If I you come across a lost silver laptop and on it there’s a sticker saying ‘Alistair. Draven’ it’s my laptop and please return it to Yavin 4 Lost Property Department. When we were shooting some interiors up at Cardington where they had built the Yavin 4 set, I walked past the R2-D2 unit who was parked up in a corner. No-one was around and I stopped, looked around and whispered ‘Alright R2?’. I swear he spun round and whistled. Maybe. Your character is one of the few who survive. Do you know the fate of General Draven? Have they told you about any future plans regarding him? Maybe you could do his voice in the animated Star Wars Rebels series? He does survive which I was delighted about and there are some great fan theories about what he’s up to now. I think he was sent back out into the ‘field’ to reappear when required. I would love to see him appear in The Rebels series, there would be a tonne of stuff to explore. In terms of the movies, the timeline is crucial in dictating what characters could appear where, so popping up in Episode VIII would mean serious ageing makeup. But if ever asked, the answer would be yes. Of course it would. I’d also say I can see a mighty future in a possible spinoff with Ben Daniel’s character: ‘Draven and Merrick’. It would have to be a sitcom though. You won’t laugh harder on a set than when you’re with Ben Daniels. For those that are prepared to wait till the end of the credits of the DVD, you’ll see he and I do our famous on set tap-dance routine dressed as storm troopers. It’ll be worth the wait. Rogue One turned out to be -as expected- a massive financial success, but it was also hailed as one of the best Star Wars movies ever. What was, according to you, the key to achieve this? It’s because the people who make the films care so much about them. They care deeply about the characters, the story, the legacy and the fans. Of course there is a commercial aspect to producing the films but I just don’t believe that’s the primary motivation; I saw it every day. They really care about the story being told. In one of the first trailers there’s this scene with you in which you ask Felicity Jones “Can you be trusted without your shackles?” Unfortunately this was cut from the movie. Were there other scenes where you were prominently featured cut? We reshot that scene a few times. It was the crucial story scene and incredibly nuanced so whilst there weren’t dramatic changes, as the edit went on, its nuances shifted slightly so we relooked at it over the months. That relates to what I said earlier about the team caring as they do about the whole franchise. And one day I’ll tell you the story about how, in a galaxy far far away, General Draven was the character who first named the mission ‘Rogue One’..
You were 6/7 when the first Star Wars was released, and now, 40 years later you have appeared in a movie which takes place just before that one. When was your first encounter with Star Wars? A New Hope was the first film I saw in the cinema. To then be the kid who stood up from his flip down seat, walk down the aisle, climb onto the stage and into the cinema screen was magical. I know Gareth felt the same because we talked about it. Since Star Wars is the most popular franchise in the world many fans and people will ‘forever’ see you as Draven. What is your opinion about this?